Sir Anish Kapoor (born March 12, 1954) is an Indian who lives and works in London. He went to London in early 1970s to study art, first at the Hornsey College of Art and later at the Chelsea School of Art and Design. He has won many prestigious awards for his visual art sculptures which include the: Premio Duemila Prize, Turner Prize, Birthday Honours of a Knighthood in 2013 and Indian civilian award of Padma Bhushan. Some of his notable public sculptures are "Cloud Gate" in Chicago's Millennium Park; "Sky Mirror" exhibited at the Rockefeller Center in New York in 2006 and Kensington Gardens in London in 2010; "Temenos", at Middlehaven, Middlesbrough; "Leviathanat" the Grand Palais in Paris in 2011. 2.2 Open thread: With the Orbit Olympic sculpture, is there too much public art? Architects have always hoped to find a way to skip that stage between design and finished building. Quoted in "Sculptor Anish Kapoor’s works an eye-opener for us". Economic Times. 25 November 2011. Retrieved on 18 December 2013. Is it my role as an artist to say something, to express, to be expressive? I think it’s my role as an artist to bring to expression;it’s not my role to be expressive. I’ve got nothing particular to say, I don’t have any message to give anyone. But it is my role to bring to expression, let’s say, to define means that allow phenomenological and other perceptions, which one might use, one might work with, and then move towards a poetic existence. 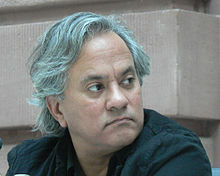 Anish kapoor in conversation with Homi K. Bhabha in 1998. Quoted in Anish Kapoor (pdf). Royal Academy Organization. Retrieved on 18 December 2013. I think I’ve had three or four moments in my work over the last twenty-five years that have been real discoveries. The pigment pieces felt to me as if they were a discovery about an object and what an object can be; how an object can be and not be. Then, of course, the void pieces. The idea that if I empty out all the content and just make something that is an empty form, I don’t empty out the content at all. The content is there in a way that’s more surprising than if I tried to make a content. So, therefore, the idea that subject matter is somehow not the same as content. Then, in a different sort of way, moving from matte surfaces to shiny surfaces. In terms of the fact that the traditional sublime is the matte surface, deep and absorbing, and that the shiny might be a modern sublime, which is fully reflective, absolutely present, and returns the gaze. This feels like a new way to think about the non-objective object. Anish kapoor in conversation with Heidi Reitmaier in July 2007 in "Anish Kapoor" by Royal Academy Organization. Red is a colour I’ve felt very strongly about. Maybe red is a very Indian colour, maybe it’s one of those things that I grew up with and recognise at some other level. Of course, it is the colour of the interior of our bodies. Red is the centre. Anish kapoor in conversation with John Tusa, 2003 in "Anish Kapoor" by Royal Academy Organization. I am interested in sculpture that manipulates the viewer into a specific relation with both space and time. Time, on two levels; one narratively and cinematically as a matter of the passage through the work, and the other as a literal elongation of the moment. This has to do with form and colour and the propensity of colour to induce reverie. Consequently, I hope, an elongation of time. Space is as complex, the space contained in an objectmust be bigger than the object which contains it. My aim is to separate the object from its object-hood. Anish Kapoor in conversation with Heidi Reitmaier, July 2007 in "Anish Kapoor" by Royal Academy Organization. It is precisely in those moments when I don’t know what to do, boredom drives one to try …a host of possibilities… [to] either get somewhere or not get anywhere. Grant, Jennifer (1 May 2012). MOMumental: Adventures in the Messy Art of Raising a Family. Worthy Publishing. pp. 184–. ISBN 978-1-61795-099-5. Jerusalem is all about a very special relationship between the ground and the sky. This work attempts to bring the two together. - India-born artist sculpts landmark symbol for museum”. Anish Kapoor Opens the Door:Modern Artist Creates Monuments that Transcend Space & Time. Retrieved on 18 December 2013. Do you know there’s a wonderful Christian idea in which Thomas stretches his hands out to try to touch Christ’s wound and Christ says ‘Noli me tangere’ (do not touch me). What your eyes see your hands will always try to affirm. Much of dealing with the non-material is about this confusion between the hand and the eye, the ear and the eye, when the thing that you look at is uncertain, your body demands a kind of readjustment, it demands certainty. Something happens to where you are, to space; time changes. Time, I think, becomes slower. The mystical truth of art is time. I’m thinking about the mythical wonders of the world, the Hanging Gardens of Babylon and the Tower of Babel. It’s as if the collective will comes up with something that has resonance on an individual level and so becomes mythic. I can claim to take that as a model for a way of thinking. Art can do it, and I’m going to have a damn good go. I want to occupy the territory, but the territory is an idea and a way of thinking as much as a context that generates objects. Artists don’t make objects. Artists make mythologies. I think I understand something about space. I think the job of a sculptor is spatial as much as it is to do with form. There’s something imminent in the work, but the circle is only completed by the viewer. On his Tall Tree And The Eye bubbled towards the heavens in the courtyard of The Royal Academy of Arts in London. Quoted in "Anish Kapoor Opens the Door:Modern Artist Creates Monuments that Transcend Space & Time." One of the influences in his design for the tower was the Tower of Babel the sense of building the impossible” that “has something mythic about it. The spaces inside the structure, in between the twisting steel, are “cathedral like”, according to Balmond, while according to Kapoor, the intention is that visitors will engage with the piece as they wind “up and up and in on oneself” on the spiral walkway. ===Anish Kapoor in Berlin: "Anish Kapoor in Berlin: 'in short, Britain's fucked'". Economic Times. 15 May 2013. Retrieved on 18 December 2013. Germans have a rather healthy respect for the arts and artists, [could] not be more different from the British perspective. In Germany, it seems that the intellectual and aesthetic life are to be celebrated and are seen as part of a real and good education, whereas in Britain, traditionally – certainly since the Enlightenment – we've been afraid of anything intellectual, aesthetic, visual. In the UK, while the arts are the second biggest sector after banking, they probably form less than one tenth of 1% of government spending. It's completely scuzzy. The UK has two things, the arts and education, and both of them it pushes into the corner. It's the hugest, hugest mistake. Why do British ministers meet anyone from the arts other than to cut them? Compared to Germany, Britain has got quite a long way to go there, frankly. It's a building with a curious, difficult history that is inexorably linked to the history of Berlin, [he said] That's very potent. You can't make a show here without some reference to all of that. And it certainly makes a show here so much more interesting. On the neo-renaissance pile in the centre of Berlin, which he created as a challenge and an inspiration. "Anish Kapoor dedicates Leviathan sculpture to Ai Weiwei". The Guardian. 10 May 2011. Retrieved on 18 December 2013. I've never met Ai Weiwei but he's a colleague, an artist. In a very simple way he is heroically recording human existence. All he's done is to record death by administration, death by corruption, inefficiency. I don't even think he's pointing that sharp a finger, frankly. Anish Kapoor dedicates "Leviathan}, his largest ever art work at the Grand Palais in Paris to dissident Chinese artist Ai Weiwei. This is a terror of a space, probably much more difficult than the Turbine Hall. It's three times the size, huge horizontally and vertically and above all the light is a killer. It's almost brighter than it is outside. "Anish Kapoor: An unknown Indian". Economic Times. 22 November 2012. Retrieved on 17 December 2013. It's a shame that I haven't done an exhibition in India till now. But I am working on one in Delhi for January 2005. If things go well, there will be another in Mumbai too. It was there [India] I realised that engineering was not my cup of tea. I proceeded to London to look for avenues and got myself enrolled into Hornsey College of Art there. Initially, there was no hope for me, but one exhibition in 1979 made me. That proved to be extremely lucky for me. I wake up early, does some meditation, take my children to school, and then go to the studio to begin my day's work. The food for his soul is typically India, but with lots of salad on the side. It is almost as if the 49-year-old global Indian was an alien in his place of birth. "Anish Kapoor's Olympic Park sculpture sends public art into Orbit". The Guardian. 15 May 2012. Retrieved on 18 December 2013. Anish Kapoor and Cecil Balmond's Orbit is a daring, imaginative and exhilarating work of art. It does not deserve to be pilloried – on the contrary, if all British public art were like this, it would be an age of glory. This is why Kapoor and Balmond have emerged as embattled heroes of public art. Their Orbit tower is not consensual, or easy to make sense of. It is wild and unexpected. It is, I believe, the most exciting British public artwork since House. Those who commissioned and created it deserve acclaim for choosing electricity over dull consensus. Open thread: With the Orbit Olympic sculpture, is there too much public art? "Open thread: With the Orbit Olympic sculpture, is there too much public art?". Guardian. 14 May 2012. Retrieved on 18 December 2013. A drunken party animal of a building and ultimately a celebration of the people of London. Everything about the process by which public art is commissioned today militates against the commissioning of good artists and the creation of good art. Rightwing think tank the New Culture Forum. A piece of vainglorious sub-industrial steel gigantism, signifying nothing.... [artists] may be imaginative... not more than a poet. Poets do not make millions. Exhibition: Anish Kapoor. Museum of Contemporary Art Limited. Retrieved on 17 December 2013. Art almanac on Kapoor’s first major exhibition in Australia. This rare and inspiring exhibition could hardly help but elicit wonder. Art media on Kapoor’s first major exhibition in Australia. The artist is a magician... nothing short of extraordinary … this is a staggering exhibition by a major artist. Concrete playground on Kapoor’s first major exhibition in Australia. Discover how Kapoor’s continual experimentation with structure and medium has led him to work with a wide variety of materials from clay, fibreglass and paint pigment, to steel and wax, creating beautiful, strange and intriguing works that counter conventional ideas of art. The Museum of Contemporary Art on Kapoor’s first major exhibition in Australia. The “Teddy” is a reference to the late Teddy Kollek, long-time Mayor of Jerusalem and the museum’s founder, in whose memory Anish’s work has been commissioned is cited here. "Israeli sky in Anish’s steel- India-born artist sculpts landmark symbol for museum". Telegraph India. 26 July 2010. Retrieved on 18 December 2013. It’s magnificent, it’s really great. It is quite simple and quite a pure piece. We picked him because he is a great sculptor. The flip side is it makes it quite interesting to work with him because not only was he born in India – he has an Indian father and a Jewish mother of Iraqi heritage – but he lived in Israel for a few years as a young man before he moved to the UK. So that actually adds another dimension but that’s not the reason (why he was commissioned). We really felt that the spiritual and immaterial aspects of his work would really make for a strong statement with respect to a work paying tribute to Teddy. [ Teddy Kollek, long-time Mayor of Jerusalem]. He came up with this very simple idea which was recognising that the location which we identified, which is an axial view straight up the main promenade of the museum at its highest point, would be the place where a simple hour glass form would offer the opportunity to invert the Jerusalem sky and built landscape. And that’s what he created – and it’s a superb thing. "Indian art makes a big splash in global markets". Economic Times. 20 October 2009. Retrieved on 17 December 2013. Mr Kapoor's work dates from his breakthrough using this medium of hyper-reflective polished and was created in a decade that witnessed Mr Kapoor winning the Premio Duemilla Prize for his British Pavilion at the Venice Biennale in 1990, winning the Turner Prize in 1991 and staging a major retrospective at the Hayward Gallery in 1998. James Sevier, a specialist in the contemporary art department at Sotheby's. Sotheby's was proud to offer the monumental work by Anish Kapoor, which manifests all the pioneering ingenuity in material and spatial possibilities that characterise the very best output of the world-renowned sculptor. These include a select group of Mr. Kapoor's early pigment sculptures, beguiling mirror-polished stainless steel sculptures and cement sculptures on display for the first time,"
The exhibition also includes highlights such as the monumental work Svayambh, which in Sanskrit, means 'self-generated'. About the Artist: Anish Kapoor. City of Chicago Organization. Retrieved on 18 December 2013. Anish Kapoor born 1954. TATE Organization. Retrieved on 18 December 2013. This page was last edited on 7 November 2018, at 11:46.